Connect or rapidly onboard your network and take control of your inbound supply chain and inbound logistics execution. Supply chain management on the Real Time Value Network is simpler and faster, enabling you to coordinate inbound supply replenishment with inbound logistics and execution to maximize efficiencies across all suppliers and logistics service providers. You can optimize service, inventory and operational costs concurrently, and gain multi-tier visibility and collaborate with your supply network in real time. Overview of Integrated Inbound from One Network on Vimeo. Contracts Management – ONE solution enables contract management for purchase and transport contracts enabled with collaboration workflows between buyers and sellers supporting Request for Quotes (RFQ), defining financial terms, service levels, and chargebacks. Optimized Execution – Only ONE enables you to execute with continuously optimized plans across all parties in real time. Only ONE integrates orders, replenishment, and logistics execution to deliver maximum efficiencies. ONE solution translates and nets demand across tiers and generates replenishment orders with continuous time representation. Collaboration workflows enable suppliers to collaborate and commit to forecasts or orders. Forecasts, orders, pre-ASNs, shipments, and track and trace further provide the full view of demand – supply match, projected inventory levels, projected receipts, shipments, dock schedules, etc. in a telescoping view of time. ONE solution also manages performance scorecards, invoicing and financial settlement based on contracted terms. Inventory Management & Replenishment – Inventory planning optimizes the safety stock levels and min/max inventory policy, ensuring the right inventory investment for the service level. Inventory management enables the inventory and replenishment policy for each SKU, thereby ensuring optimal replenishment with the right stock at the right time at the right location. Forecast and Order Management & Collaboration – This solution enables the forecast collaboration and discrete order management and collaboration, integrating with your ERP or legacy systems. Suppliers can commit to the forecasts to provide the advanced visibility of their capability. Order collaboration provides the flexibility for you to collaborate with your suppliers around quantity, and ship dates to start the accurate fulfillment process. 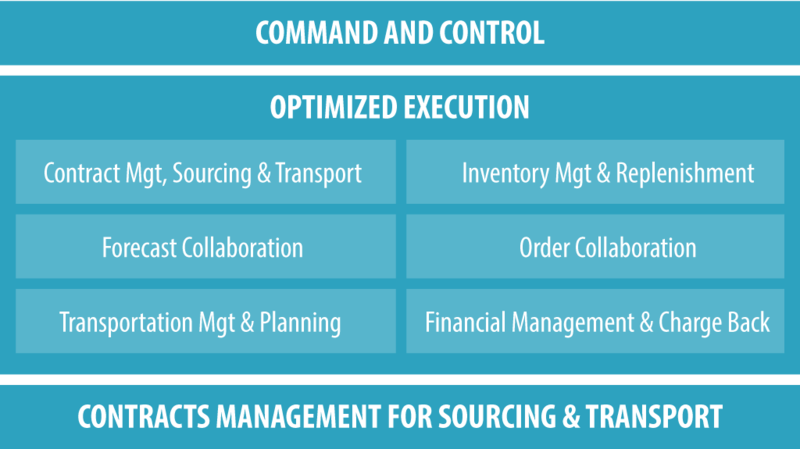 Transport Management – Pre-ASN and transport order process allows transportation planning to take place simultaneously while suppliers are preparing product for shipment. Transportation execution provides the shipment tendering and booking capability. The ASN and track-and trace provide the visibility of the shipment whereabouts. While the appointment scheduling further defines the shipping and delivery time slots for optimal timing during execution. Financial Management & Chargeback – Provide the capability of invoicing process between buyer and suppliers. Financial management is fully integrated into execution ensure contract pricing is reinforced, and automated 3-way matching. The charge-back system also enables the claims and credits based on the performance defined in the contract. The Real Time Value Network offers incredible value, but we don’t expect you to take our word for it. Request a demo and see it what it can do for you. One Network offers a flexible and power solution. Download the Inbound Supply Buyer’s Checklist to discover the key features and capabilities an Inbound Solution should provide. Need to get in touch? Visit our Contact page to contact us through a number of channels.